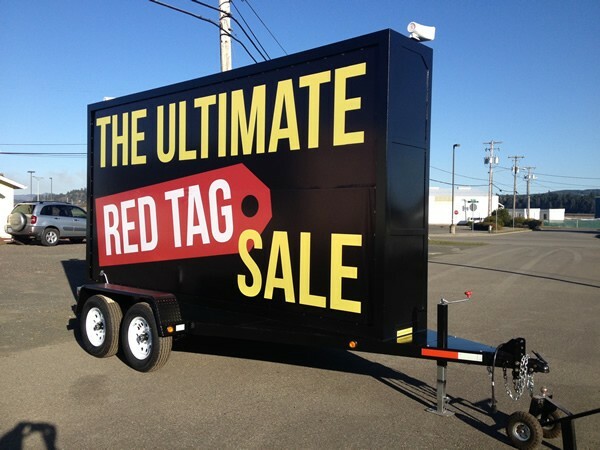 If you are looking to make a big splash message, then our 10’x20’ mobile billboard truck is the right option for you. Our massive static truck displaying your ad is sure to get you the attention you desire. This truck is the largest and most bold of our entire fleet. It is also the most popular! Your message will be further complimented by our well-maintained vehicles. You won’t find any old rusty trucks in our fleet. Our vehicles are freshly painted and washed before we hit the streets. Depending on your destination to deliver your ad, impressions can be between 250,000-400,000 in a single five-day campaign. When you use a Stop and Stare mobile advertising truck, the expression “Go big or go home!” will show your competition who is the boss! Opening up a new location and you want to get the buzz going? Do you have a business that may be off the busier routes traveled and does not have the street presence you would like? If that’s the case, our 10’x20’ mobile trailer is the right fit for you. We rent this trailer by the day, week, month, or year. The trailer holds two signs and can be left on any private property where you do not need a permit to have a trailer. Typically, this works best on any private parcel of land. It’s great to leave in school parking lots for upcoming events such as: fairs, fund raisers, up-coming elections, or registration opening announcements. It’s a perfect grand opening sign, special sale event notice, or even a going-out-of-business sale event. It’s also great for car dealerships, special tent sales, holiday promotions! If you have the space available to park our trailer on your site, people that never found your business before will suddenly know who you are. Long term rentals are available and pickup and delivery is always included in our pricing. Keep it for a day, week or year! The choice is yours. Looking for a street team to get into the heart of crowds of people that are pouring into the subway or leaving a concert arena? How about brand ambassadors outside your place of business, giving away coupons or other promotional material? From flyer and promotional material to backpack walking boards, we have your solution. Send our team of brand promoters out to get your information in the hands of your customers. We offer our exclusive walking boards for impressive lighted backpack walking boards. String three, four, or even five together and create a wall of promotion walking down the busy streets of New York City. This is great for club and nightlife venues. It’s really a marketing application that can be used from cafés to carnivals. Put your literature in the hands of your customers with Stop and Stare brand ambassadors.